After days of reports, the Browns finally confirmed the hiring on Saturday. 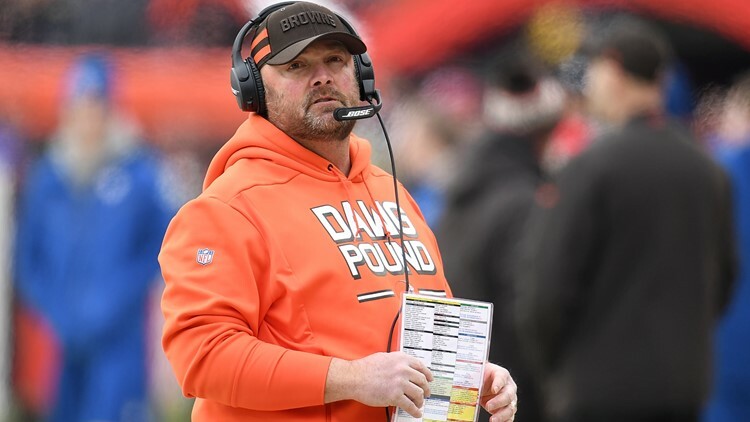 CLEVELAND -- The Cleveland Browns sought a leader of men when looking for their next head coach, and the search committee believes they found that man in former interim offensive coordinator/running backs coach Freddie Kitchens. "We are thrilled to announce Freddie Kitchens as the new head coach of the Cleveland Browns. He did an outstanding job in his role as coordinator, and we know that will continue as he steps into the role of head coach. Freddie demonstrated all of the qualities that you want in someone who is leading your organization. He has unquestioned leadership. He is a man of integrity. He fosters a collaborative environment. He gets the most out of his players and our players loved playing for him. We are happy to have him leading the Cleveland Browns going forward." "It’s an honor to be named the head coach of the Cleveland Browns. As I’ve said before, I think Cleveland and I get along pretty well. My family and I have really enjoyed our time with this organization and in this community over the last year. I’m grateful for the opportunity and responsibility Dee and Jimmy Haslam have granted me. John Dorsey led a thorough search process and I was excited about having the opportunity to come in and talk about my vision for the future of this football team. There are a lot of great people in this front office that I’m excited to continue to work alongside with a singular focus on winning. I’ve been to one Super Bowl that didn’t end the way I wanted it to and that disappointing memory is what really drives me. Our goal is to work extremely hard to earn the right to raise that Lombardi Trophy for our fans and this city." Kitchens is the 17th full-time head coach in the history of the Browns organization and the ninth since the team returned to the National Football League ahead of the 1999 season. Kitchens was interviewed for the head-coaching vacancy on Monday, and made quite the impression, so much so that the search committee chose him from a list of candidates that included six others with various coaching experiences in the NFL. "We had a deliberate and thorough process and one thing became evident -- that Freddie is the best person to lead the Cleveland Browns. We saw firsthand what Freddie is able to do. He showed that he is consistent on a day in and day out basis and that he is a true leader. He helped unify our players in a tough time. He raised the bar for our offense last year, and I have no doubt he is going to raise the bar for our entire team." Kitchens’ elevation to head coach caps an unusual 12 months for the well-traveled assistant coach. Hired on January 24, 2018, Kitchens was initially the running backs coach and associate head coach. During an unprecedented staff upheaval at the midway point of the 2018 season, Kitchens took over the play-calling duties when coach Hue Jackson and offensive coordinator Todd Haley were dismissed. In his end-of-the-year press conference on December 31, 2018, Dorsey said that interim coach/defensive coordinator Gregg Williams was not the only in-house candidate to earn an interview for the full-time head-coaching vacancy over the final eight weeks of the 2018 regular season. Kitchens, whom has been a popular interview request from other NFL teams, helped the Browns increase their points per game and got solid play out of rookie quarterback Baker Mayfield. Under Kitchens’ direction, Mayfield completed 180 of his 263 attempts (68.4 percent) for 2,254 yards and 19 touchdowns against eight interceptions. Mayfield averaged 281.75 yards and 2.375 touchdowns per game with Kitchens calling the plays. "It was great working with and learning from Freddie last year. He has such a creative mind. He creates mismatches and just put guys in position to take advantage of their opportunities. He puts trusts in us as players. He’s the same guy every day. I’m really excited about 2019 and the future of the Cleveland Browns." Used sparingly by Haley over the first half of the 2018 season, Chubb rushed for 788 of his season total of 996 yards and five of his eight touchdowns on 140 carries under Kitchens. After the changes in the coaching staff, Chubb averaged 5.63 yards per carry and became a contributing member in the passing game as well. Not known for having great catching ability out of the backfield, Chubb turned 18 catches into 139 yards and two touchdowns over the second half of the 2018 season. Kitchens has 20 years of coaching experience, including 13 at the NFL level. Before joining the Browns, Kitchens was a tight ends (2007-2012), quarterbacks (2013-2016) and running backs coach (2017) for the Arizona Cardinals. Additionally, Kitchens was the Dallas Cowboys’ tight ends coach during the 2006 season. Prior to his NFL coaching career, the 44-year old Kitchens worked at Mississippi State, North Texas, LSU and Glenville State.